That things are so fast now, we find it hard to take them in, though I’m not only talking broadband, breaking news, new builds. Nor any picture, time or space brought to screen on your slick smartphone at running pace. I mean dreams. That come from nowhere like the swans we saw driving back last Sunday along the wooded road (before the roundabout, fast-stop Starbucks, Esso petrol station). 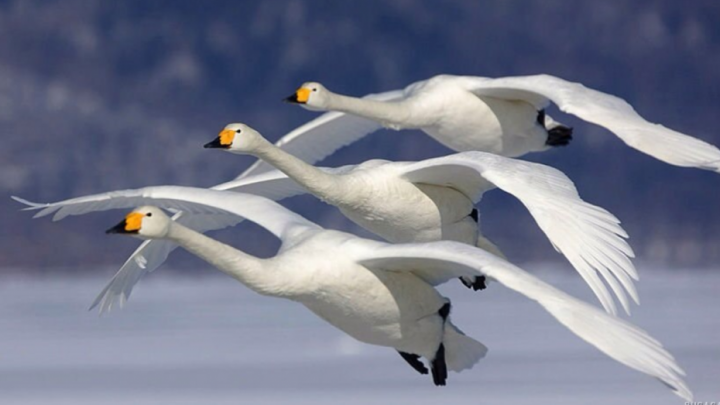 Above us the swans—emblems of power, purity, resonating all that’s beautiful, their wings so strong, startling our passing through. But also, in those long, white necks stretched out, a vulnerability, I didn’t suspect. Something else lurking there, a frisson of another time, a far-off place. As we drove, the swans soon lost to us, the mid-January sun, became a globe of liquid light between the trees, a huge orange scintillate intent on hide and seek. And, that evening, the Wolf moon. Wolves, I’m told, don’t exactly howl at the moon—their howling’s to communicate: warning, danger, stay away or desire, here I am. Their faces, moon-turned, for the clearest sound. And, somewhere out in the snow-drifted, snow-scudded cold, the things inside I can’t put to time: my father’s death, that winter sun, wolves’ calls, those high-sky swans—all oscillates in my mind, never gone. The wolf-moon too, blood-red, still with me, though it disappeared as I slept. When I woke, something else always there, echoing, took its place. Not an in-transit orange silhouette, nor howls bayed out long in cool moon-bright, but something (and really, only, probably present for a moment’s grace) in the not-yet-eclipsed dream I’d had—that sunlit, snow-swan image of your face. Lisa Dart is the a poet, author of The Self in The Photograph (Tall Lighthouse, 2005), The Linguistics of Light (Salt Publishing, 2008), a winner in the Grolier Poetry Prize USA (2004), Aesthetica Poetry Competition (2013).